Assigned status Up to Date on December 24, 2014. There are many etiologies for oculomotor palsy: vasculopathic process, trauma, compression (e.g. aneurysm) and/or infiltrative (e.g. leukemia), toxic (e.g. chemotherapy). The manifestations depend on the affected area of 3rd nerve track. In some cases, the precise site of the lesion is clear, whereas in others, the location of the lesion is speculative. Usually produce bilateral defects. This is explained by the anatomy of the nucleus. It is divided in subnuclei according to the enervated area. Each superior recti (SR) are enervated by contralateral CN III subnucleus for this reason a nuclear CN III palsy would produce paralysis of the contralateral SR. Both levator palpebrae superioris are innervated by the one subnuclei (central caudal nucleaus) for this reason a nuclear affectation would produce bilateral ptosis. Patients with damage to the oculomotor nuclear complex need not have ipsilateral pupillary dilation, but when involved, it indicates dorsal rostral damage. Mostly caused by ischemia, usually from embolic or thrombotic occlusion of small, dorsal perforating branches of the mesencephalic portion of the basilar artery. Lesions at this level can produce complete or incomplete palsies. The majority of the time it cannot be differentiated from lesion outside of the midbrain. When the lesion is adjacent to CN III nucleus (midbrain) it can produce several manifestations that have been described according to other neurological manifestations. Lesion at the superior cerebellar peduncle (Nothnagel’s Syndrome) presents ipsilateral 3rd nerve palsy and cerebellar ataxia. Lesions at the Red Nucleus (Benedikt's Syndrome) are characterized by ipsilateral 3rd nerve palsy and contralateral involuntary movement. Lesion at the cerebral peduncle (Weber’s Syndrome) produces ipsilateral 3rd nerve palsy and contralateral hemiplegia. It is important to remember that lesions can present combination of these findings depending on the degree of the insult. In addition, although it is classic that CN III separates in superior and inferior ramii at the superior orbital fissure, sometimes lesions at the fascicles can produce isolated dysfunction of either the superior and inferior division. The most common causes are ischemic, hemorrhagic, compressive, infiltrative, traumatic, and rarely, infiltrative and demyelinizating process. This space is defined as the area traveled by the oculomotor nerve between the ventral surfaces of the midbrain to the entrance of the cavernous sinus, also known as the interpeduncular fossa. Oculomotor nerve damage in this area can produce varied presentations. CN III palsy with fixed dilated pupil, it is important to recall that pupillary fibers occupy a peripheral location and receive more collateral blood supply that the main trunk of the nerve. This is why they are susceptible to compression (e.g. aneurysm). The most common known etiology is a posterior communicating artery aneurysm. This is a medical emergency. CN III palsy without pupil involvement, as mentioned above pupillary fibers occupy a peripheral location and receive more collateral blood supply that the main trunk of the nerve. For this reason are less susceptible to ischemia.. This is why in most of the cases patients have diabetes mellitus, systemic hypertension, atherosclerosis and in some cases migraine. Nevertheless, compressive masses or aneurysm can also cause it. On the course to the cavernous sinus the CN III rest on the edge of the tentorium cerebelli. The edge of the uncal portion overlies the tentorium for this reason in the setting of increased intracranial pressure this brain section can herniate producing displacement of the midbrain compressing the ipsilateral oculomotor nerve. This causes ipsilateral ophthalmoplegia and mydriasis. The most common cause of uncal herniation is intracranial hemorrhages. 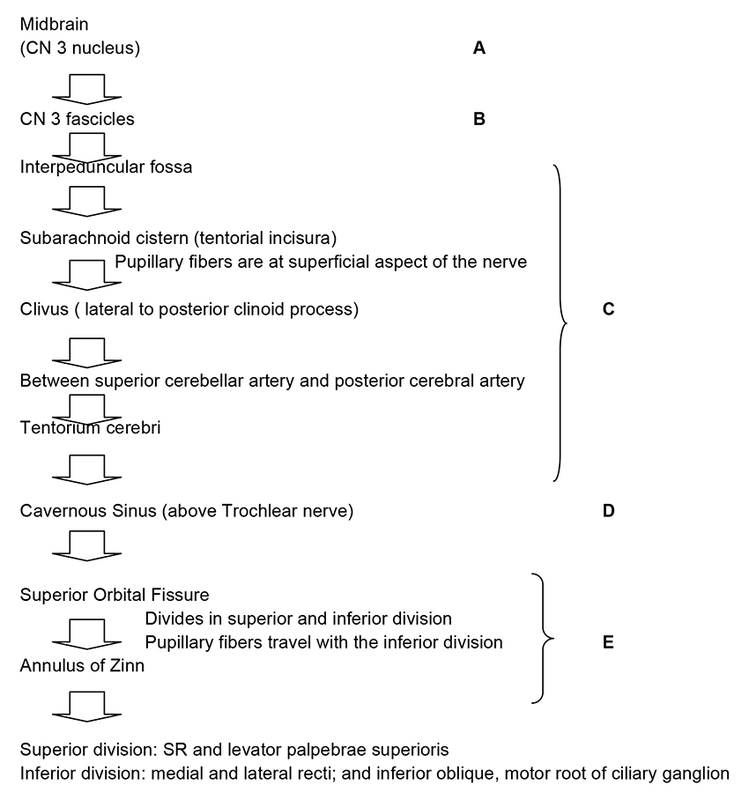 Lesion at these zones can produce isolated CN III palsy, but it is most commonly associated with other cranial nerves dysfunctions. Differentiating between lesions at the cavernous sinus versus the superior orbital fissure can be challenging and sometimes the literatures describe it as sphenocavernous syndrome. It presents as paresis of oculomotor, trochlear and abducens nerves with associated maxillary division of trigeminal nerve, producing pain. This can be caused by primary (direct invasion) or secondary (intracranial/intraorbital lesion compressing these areas) lesions. Most common causes are tumor (e.g. meningiomas) There is another described pathology within the cavernous sinus and superior orbital fissure that presents with painful ophthalmoplegia known as Tolosa Hunt Syndrome. It is described as an idiopathic granulomatous inflammation. This is a diagnosis of exclusion, therefore tumors, metastasis or aneurysm must be ruled out with neuroimaging. Although tumor are the most common causes of lesions at this zone, vascular processes can also produce damages to the structures present in it. Cavernous sinus thrombosis, carotid cavernous fistulas, syphilis, vasculitis, and/or autoimmune connective tissue diseases (e.g. systemic lupus erythematosus) can produce painful ophthalmolegias typical of cavernous sinus syndrome. Lesions within the orbit are associated with visual loss, ophthalmopleagia and proptosis. 3rd nerve ophthalmoplegia can be associated with trochlear and abducence nerves palsies. It is important to remember that at the orbit the oculomotor nerve divides into superior and inferior division. This can cause partial oculomotor nerve palsies. Most common etiologies: trauma, masses, inflammation, and/or infiltrative processes. Although there are many risk factors, some of them can be controlled to minimize the risk of acquiring oculomotor nerve palsy. It is encouraged to maintain blood pressure and glycaemic control which are the most common causes of vasculopathic & nbsp; third nerve palsy. Acquired oculomotor nerve palsy is a clinical diagnosis. The most common ocular manifestations are diplopia and ptosis. In addition, depending on affected section of the third craneal nerve track it can also produce other neurologic manifestations as involuntrary movements, hemiplegia, and altered mental status. Consist on complete ophthalmic exam including visual acuity, ductions and versions, levator function, pupils reaction to light and to accommodation. In addition, general physical and/or neurological evaluation should be consider. The presenting signs depend on the affected area of 3rd nerve track. In some cases, the precise site of the lesion is clear, whereas in others, the location of the lesion is speculative. It can present in different ways causing somatic extraocular muscle dysfunction (superior, inferior, and medial recti; inferior oblique; and levator palpebrae superioris) and autonomic (pupillary sphincter and ciliary) muscles. Symptoms depends on the location of the lesion. The most common ocular complaint is diplopia secondary to somatic extraocular muscle dysfunction, but pain and ptosis can also me present. Acquired oculomotor nerve palsy can be secondary to many etiologies. Nevertheless, neuroimaging is usually done specially if intracraneal pathology is suspected. In a conscious patient presenting with ophthalmoplegia, ptosis and mydriasis a compressive etiology, as an intracraneal aneurysm, must be ruled out. If an intracraneal aneurysm is suspected a computed tomography angiography (CTA) and/or magnetic resonance imaging (MRI) must be done, with a 90% sensitivity in aneurysms of 3mm or greater in diameter, although the gold standard is the digital substraction angiography (DSA). Acquired oculomotor nerve palsy evaluation depends on signs and symptoms, patient’s age and systemic diseases. Management depends on the presented scenarios. In a conscious patient presenting with ophthalmoplegia, ptosis and mydriasis a compressive etiology, as an intracraneal anurysm, must be ruled out. In the other hand if a patient presents with complete oculomotor nerve palsy without pupil involvement it is most likely to be related to ischemic process, but compression and inflammation must be considered. The majority of complete or incomplete CN III palsy without pupil involvement are secondary ischemic process. These patients observe an improvement after the first 4 weeks with full resolution in 12 weeks of the insult. Those patients presenting with that are left with a residual deficit can submitted to strabismus surgery after 6 of stability to maximize the possibility of spontaneous resolution and surgical outcome. In these cases the main goal of strabismus surgery is to provide alignment in primary and reading position. American Academy of Ophthalmology. Oculoplastics/Orbit: Oculomotor (cranial nerve III) palsy Practicing Ophthalmologists Learning System, 2017 - 2019 San Francisco: American Academy of Ophthalmology, 2017. ↑ 2.0 2.1 American Academy of Ophthalmology. Basic and Clinical Science Course. Section 5: Neuro-Ophthalmology, Chapter 8 The patient with diplopia. P.228-229 2010-2011. ↑ Capo, H., M.D., Warren, F., M.D., Kupersmith, M. , M.D. Evolution of Oculomotor Nerve Palsies. Journal of Clincal Neuro-ophathalmology (12)1:21-25, 1992. Bhatt, VR. Naqi, M. Bartaula R., Murukutla S., Misra, S. Popalzai, M., Paramanathan, K. Dai, Q. T cell acute lymphoblastic leukaemia presemting with sudden onset right oculomotor nerve palsy with normal neuroradiography and cerebrospinal fluid. BMJ Case Rep. 2012 Mar 27;2012. Appenzeller S, Veilleux, M. Clarke, A. Lupus. Third cranial nerve palsy or pseudo 3rd nerve palsy of myasthenia gravis? A challenging diagnosis in systemic lupus erythematosus. 2009 Lupus. Aug;18(9):836-40. This page was last modified on April 8, 2019, at 11:43. This page has been accessed 240,617 times.